Many homeowners who want to update their kitchens may find themselves asking a few simple questions. What can I do to my kitchen to make it more functional? What can I do to make my kitchen look more modern? How can I liven up my dull and boring kitchen? How can I increase the value of my kitchen? The answer is simple, start by updating your kitchen counters. Whether you are completely overhauling your kitchen or you are just ready for a simple facelift, your kitchen countertops are a central part of your kitchen’s appearance. There is a wide variety of options when it comes to kitchen countertops. You may find the process a little daunting; countertop surfaces ranges from the popular granite to the rare glass and terrazzo. ERX has chosen seven of the most popular countertop materials to help you determine what kind of surface might fit your kitchen needs. Granite is full of beautiful colors and patterns found in nature and make each countertop unique. 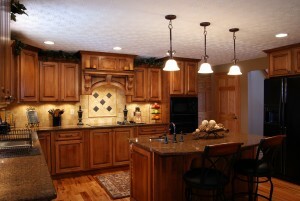 Granite is durable and stands up against water spots, knife nicks, excessive heat, and normal day-to-day wear and tear. However, like most stone, granite must be seal often to avoid stains. Granite can also be pretty heavy, you want to make sure the cabinet boxes are sturdy enough to support the weight. Solid surfacing is made up of acrylic and polyester and it is nonporous, making it virtually maintenance free. Solid surfacing can be susceptible to burns and scratches, which can easily be sanded out. You can virtually choose any color and pattern you desire and the installation is seamless, meaning that there are no cracks for dirt and debris to find. The downside of solid surfacing is that is has an artificial look and feel and can get quite expensive. As we mentioned before, it also can’t stand up to excessive heat and sharp knives. Quartz surfacing is made up of resign and quartz chips tinted with color. Also known as engineered quartz or engineered stone, quartz surfacing is a good compromise between the natural beauty of stone and the easy maintenance of solid surfacing. Quartz surfacing doesn’t have the natural variegation of granite, making it evident that it is a manufactured material, but its durability can make up for that. Marble has a vibrant luminescence and distinctive veining and it is extremely popular. Marble is one of the most elegant countertop surfaces you can get. It stands up to heat and remains cool, it’s the top choice for pastry and baking stations. However, marble is susceptible to staining, even if it has been sealed. Marble is also prone to scratch and chip, that is why most homeowners only use marble in small sections of their kitchens. Ceramic and porcelain tile offers an extensive library of colors and designs. Tile works with almost any style of kitchen, ranging from rustic to modern. Tile can hold its own when it comes to excessive heat and sharp blades. It can easily be replaced when one or two tiles chip or crack. Unfortunately, unsealed grout is prone to staining and can encourage bacterial growth if not properly cleaned. Rolling out dough and balancing a cutting board can be difficult on tiles uneven surface. Stainless steel are mainly used in commercial kitchens and can be custom made to fit your kitchen. Stainless steel is a great option for high traffic kitchens because it is nearly indestructible and it holds up against excessive heat and deters bacteria growth. The downside of having stainless steel countertops is having to constantly wipe off the fingerprints and smudges. Stainless steel can also dent and can make your kitchen loud as pots and pans are moved around and clang on the surface. Chemicals can affect the color and cause etching in your stainless steel countertops. Butcher block fits best with traditional or country style kitchens. It has a classic appeal and maintains a fresh look. Butcher block has a warm natural appearance that can be dented and scratched by knives. Some homeowners like the worn look that the butcher block ends up with. Butcher block can swell and contract moisture, attracting bacteria that needs to be disinfected constantly. Interested in learning more about countertops? Let’s talk! Contact the professionals at ERX in Las Vegas! Our kitchen design experts can put your favorite countertops into a custom kitchen plan that fits the style of your dream kitchen!